The Innova Fitness XBR450 is a folding exercise bike with a difference or two. A fully adjustable seat for a comfortable fit. It can be moved both horizontally and vertically (4 way adjustment). It is also priced affordably. Which all helps to explain its’ popularity. It looks like you can get a good affordable low impact cardio in your own home. It saves on having to go to the gym and those fees as well as being able to avoid the bad weather. As well as those features it can be folded up to save space, has a computer to track performance and hand pulse sensors for measuring your heart rate. In my review I take a look at how these great looking features work and how the bike operates overall to see if you get a bike you can rely on and isn’t more problems than it’s worth. It has a steel frame and stabilizer bars that give a stable platform with only a little bit of wobble that isn’t enough to be concerned about. You can get on with your workout without being worried about it toppling over or moving around. It does need to be set up on a level floor to prevent it rocking as it doesn’t come with leveling feet to balance up the bike. If there is a little unevenness in the floor this can be helped with putting it on a rubber exercise mat. The bike has a reasonable one year limited warranty on materials and workmanship for the price. On the whole people like how it is constructed and they can get a good workout for a good period of time without concerns of it breaking down. The bike comes with more adjustability than you see on other folding exercise bikes – you can move the seat horizontally and vertically to get the best fit for you. This allows you to not only get a good comfortable fit for the legs but also for the upper body when using the handlebars at the front. Making the adjustments are quick to do – it uses pop-pin knobs and preset holes. You loosen the knob and pull to release the pin and then slide the seat into position and then tighten up into place after inserting pop-pin into the pre-set hole. This makes it suitable to be used by multiple users to get their exercise as they won’t get held up and the bike will fit them. There are people who are 4 ft 11 ins who have said they get a good workout from the bike but do need a cushion behind their back to reach the pedals properly. Over 5ft 10 ins you are likely to find that you don’t get the full range of motion in your leg as it won’t get fully extended (slightly bent) when at farthest point of the pedal motion. The magnetic resistance is manually controlled using the tension knob that is just below the console. It is easy to reach and turn to increase or decrease the level of resistance. The 8 levels of tension are marked on the knob. This gives you a good way to objectively set how hard you want to work and return to a previous setting. It does go from very easy which is great for beginners up to moderately hard for those who want to challenge themselves a little. It’s not going to be hard enough for elite athletes and those wanting to really push themselves hard. It’s best for those starting out and/or those wanting moderately difficult workouts. Levels 1 and 2 have very little resistance which can be great for those who are looking to get started or rehab (as advised by a doctor). Many will find the levels 3 – 6 are what they want to get their heart rate up and get a sweat on. 7 and 8 will for many be something they can keep going for a short period where it is like going up a slope rather than pedaling up a tough hill. As the resistance is manually adjusted you can use the bike where you want as it doesn’t need to be plugged in to the wall to do this. The dual flywheel and belt drive provide a quiet and consistent pedaling experience. However at the higher levels of resistance you are likely to find that you start to notice variation in the pedaling as they slow down due to the resistance working as a break as you move round the top/bottom of the pedal motion. It is low maintenance with no requirement or lubricating or adjusting tension. The pedals and multi piece crank provide a solid platform to push against without any slipping or flexing at all levels of resistance. To help to keep your feet on the pedals they have plastic straps that can be tightened to provide a secure fit on them. They are designed to work with athletic shoes or similar. You fit them over tabs on the pedals which can be tough at first until the plastic softens up a little. If you are the only one using the bike you only have to do it once as you can slip your feet into them. The pedals aren’t directly below you like they are on an upright or spin bike nor are they out in front like you get on a recumbent exercise bike. They are in between – out in front and down. Most people find it a comfortable position and it is low impact. But, if you are used to riding a bike you may find it takes a little getting used to. It is possible to pedal backwards and forwards. < strong>Seat. It has a large seat with some cushioning which along with the backrest you may find comfortable. It’s better than a standard bike seat. However not everyone is going to like the seat. That is just the way it is with these seats – not everyone has the same preferences as to what is comfortable or not. If you haven’t ridden a bike for awhile it can take some time until you get used to it and wear the seat in. But even after that you still might be unlucky with the seat – a gel seat cover or double up towel might is often enough to provide sufficient comfort so you can exercise for as long as you want without too much discomfort. Getting on to the seat may be a little bit of a challenge for those who have joint issues as you have to lift your foot to get over the x-frame even though the s-shape helps a little. Some people may need the help of a small step to do this easily and get up on to the seat. It does have a small back rest that you can lean back on to but there is quite a gap between it and the seat. It does provide a little bit of support and stops you from going over backwards. But you may find the gap too big for real comfort and support. You can put a cushion between the seat and the backrest which provides better support and comfort. Handlebars. There are 2 sets of handlebars – one at the front around the console and one by the seat. Although there are handlebars at the front the bike isn’t designed to be used like a spin bike where you stand on pedals – with it having it’s pedals out in front it is for sitting down. These handlebars can’t be moved, they are fixed in place. Both sets of handlebars are covered to provide a more comfortable grip so your hands don’t slip when they get sweaty. If you are on the short side you may find that the handlebars can get in the way when getting on and off the bike as you can’t slide on to the seat sideways. The handlebars at the side of the seat do move backwards and forwards with the seat but not on their own. They do give you something to grip for leverage and can be used a little like armrests but you may find your arms ache if you lean on them hard for too long. Noise. The bike operates very quietly so that you can use it without having to turn the TV up or your media devices. You can use it without disturbing others in the house at any time of day or night. The loudest noise is likely to be heavy breathing from exertion. Along with the size and folding up the quietness of the bike makes it good for an apartment as you won’t disturb your neighbors. If you’re on an upper floor you could put the bike a rubber exercise mat that will prevent any unlikely noise or vibration being heard in the apartment below. Cleaning. The bike itself isn’t going to make dirt and dust but it will need some cleaning due mainly to sweat from users. Sweat is very corrosive so it is good practice if you want your bike to look good and perform well to wipe this off the bike after each use. The sweat may also drop on the floor and if you want to protect that you may want to consider putting the bike on rubber exercise mat. Being able to fold the bike down helps with where you can store it. Unfortunately the folded up dimensions aren’t available but they do normally fold down to half the footprint size. It allows it to be stored in a closet or behind a door. Folding it is easy with you bringing the legs together similar to ironing board which also brings together the top half too. It’s then ready to store. You do need to drag or carry the 44 lbs bike as it doesn’t have transport wheels to help you with moving. The bike arrives requiring some assembly. But most of it has been put together. You are required to add the pedals, seat, handlebars display and media tray. The tools needed to complete the job are included. It can be assembled easily within an hour or two by one person. Some people say they get it done much quicker than that. You may want a second person to help holding the pieces in place as you add them to the bike. The console measures time, distance, calories, speed, odometer (cumulative distance exercised) and pulse when the hand sensors are gripped. You can have just one measure displayed and press the mode button to move between them or you can choose scan mode and it will display each measure for a few seconds before moving on to the next one. The sensors are on the handlebars that are next to the console. So you do need to be leaning forward to use them. It is a small screen but the numbers are large enough to see clearly from the seat although you might struggle to see the arrow to let you know which measure is being displayed. The screen isn’t backlit so if using when the light isn’t the best you’ll likely struggle to see the numbers clearly. Both hand pulse sensors need to be gripped to read your heart rate. It can be a great way to help to keep your cardio training effective by training in the heart rate zone. The console monitors your heart rate but doesn’t have targets (from what I can tell(. However, there is an issue with these type of sensors. It is one shared by all bikes that use them. They can be very unreliable. It’s hard to get a consistent and accurate reading. Many people can’t get them to work properly. Some do, so it is worth trying them out first but if you want a better way to do this then it is do this separately using a heart rate strap and monitor. It is battery powered by 2 AAA batteries that are included. The console comes on automatically when you start to pedal and will turn off after few minutes of no activity which help to conserve the battery. The calories is a calculated number that doesn’t take into account your weight or the resistance into the calculation – so it is okay as a general guide and comparing workouts but not for anything else. If you like to track you numbers you have to do this manually as you can’t upload/download the numbers to a fitness account. This information is not disclosed but they normally fold down to about half size. The tablet holder is one of the attraction of this bike over other folding exercise bikes. It will fit Ipads (including minis), tablets and kindles. They fit on a ledge and lean back on to the holder. It doesn’t have anything to keep them in place but the bike doesn’t move around so they shouldn’t fall off while you exercise. Although you might want to put a strap around them if you like to have more assurance. With it being above the console it allows you to also see your measures while watching movies or reading books etc – For most people it will be at a comfortable height for viewing. The bike is quiet so you can hear the media device easily without having to plug them into speakers (the bike doesn’t come with them, nor does it have a charging port). There aren’t any other accessories – there isn’t a place for a water bottle. However, you can balance a bottle where the frame meets the seat post due to it being a double frame construction. To get the best angle for your viewing it is possible to tilt the tray back which also make the media devices seem to be more secure too , to me. Most feel that the devices are on the tray securely. But it isn’t an integral part of the bike so if you prefer you don’t have to add it to the bike when you assemble it or you can take it off later too. This can help you see your TV easier if your prefer to watch that as you exercise. The bike gets good ratings from customers with 79% rating it a 4 or 5 in their reviews. There are a couple of common issues with the bike mentioned in the reviews, which some people aren’t happy with. But most are pleased with the bike being please with what they get for the price. They like the two seating positions you can have of sitting back on to the backrest or more upright using the handlebars at the front for support. It provides a low impact workout and doesn’t take up much room. It is a bike they find they can use when they want with some using it every day to help lose weight and improve their fitness. And of course the fact it can be folded up to put of the way when not in use. They find when using the media tray that the time flies by while they exercise. This is what you paying a little extra for – the added convenience and hopefully for a more enjoyable workout. It also provides a low impact workout and is a space saver too. When I checked Amazon it qualified for free shipping. 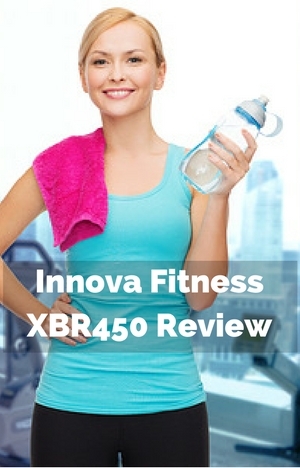 The Innova Fitness XBR450 is great for those who don’t have much space or just don’t want a piece of equipment taking over their home when not in use. It doesn’t take up much room when in use or folded. It can be used at any time and in apartments due to it being very quiet. More than one person can use it as the seat position is fully adjustable and is easy to do. The media tray makes it easy to be entertained as you workout so the time just flies by! It does have 8 different levels of resistance from easy to harder to cater for beginners and those wanting up to moderately hard workouts. The resistance doesn’t suit those who want tougher workouts. You get an exercise bike that can help you meet your fitness goals with cardio exercise that is easy on your joints and doesn’t cost the earth in your own home.